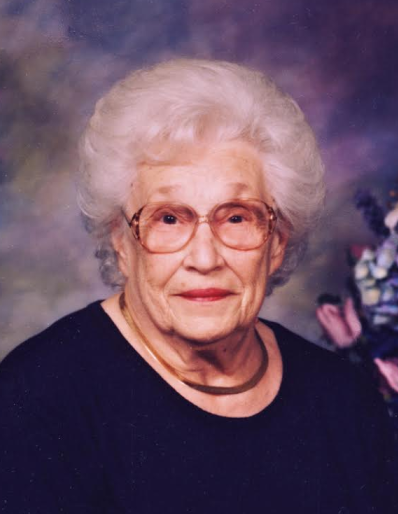 Nova J. Greenler, age 98 of Holgate, passed away Friday, May 4, 2018, surrounded by her loving family. Nova was born June 27, 1919, to Alvin and Helen (Hornung) Groll in New Bavaria. She graduated from Bowling Green State University (B.S.Ed.) on June 4, 1943. Later that same day Nova married Marion D. Greenler, and the very next day she waved goodbye to her new husband as he left for the Navy. Nova and Marion were married for forty-nine years and had two beautiful children. Nova was an attentive mother, an artistic spirit, an involved member of the Holgate community, and an active member of the St. Peter’s Lutheran Church congregation. Many of the banners she created still hang in the church today. Nova was preceded in death by her husband, Marion Greenler, and sister, Margie Beck. She is survived by: her children Dianne Greenler and Lynn (Sandy) Greenler; her grandchildren Tim (Laurie) Greenler, Mike (Brandy) Greenler, and Alexa (Joe) Bishop; and caregiver and dear friend Andrea Valdez. Nova was a devout Lutheran, as well as, a beloved wife, mother, daughter, sister, and friend. As the matriarch of our family, Nova will be dearly missed by all who loved her. Her funeral service will be held on Saturday, May 19 at noon, with visitation two hours prior, at St. Peter’s Lutheran Church, Holgate (710 Joe E Brown Ave). Burial will follow in the church cemetery. In lieu of flowers, memorials can be made in Nova’s memory to the Henry County Hospital Foundation. Condolences may be made to the family at ZachrichFuneralHome.com.